The snow blew in the window as she offered styrofoamed coffee and a cup of chili. “Thank ye,” he said, putting both into a beat up mini-Coleman at his feet. He smiled, tucking his hands back into the camo jacket sleeves, holding the cardboard with just two fingers. She drove away amid her daughter’s semi-hysterics about how the doors weren’t even locked and how he could’ve just reached in and grabbed one or both of them. Staci picked up her jacket and backpack. I handed her the beat-up cooler. I do not remember how I ended up here. I only come here on winter nights. Most times I walk around the city. There are treasures everywhere. It’s an artistic way to live, really. We’ve become a cash, carry, cast aside society. Perfectly good cakes and pies in dumpsters. Coats from last year with just a stitch in the zipper. I’m not crazy, you know; I have a college degree. I used to be counselor. There’s just so much need, so much chaos, so much want – how the hell could I help them when I could barely keep myself going? This once – a girl – I even remember her name: Staci – she wouldn’t tell me why she ran away. I mean, at least I think that’s what she did. She never really said, but she seemed to like living on the streets. Homeless. Except she had a home – she just didn’t want it. I dunno. Maybe she didn’t want to be there, but she couldn’t leave the streets either. She traveled light – kind of like me now: backpack and a cooler. 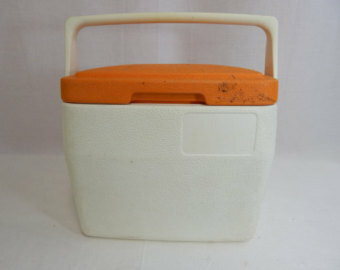 A cooler just like this one . . .